On 25th September 2014, this dynamic programme gave the corporations a push to invest money in manufacturing products in India, hence “Make in India”. 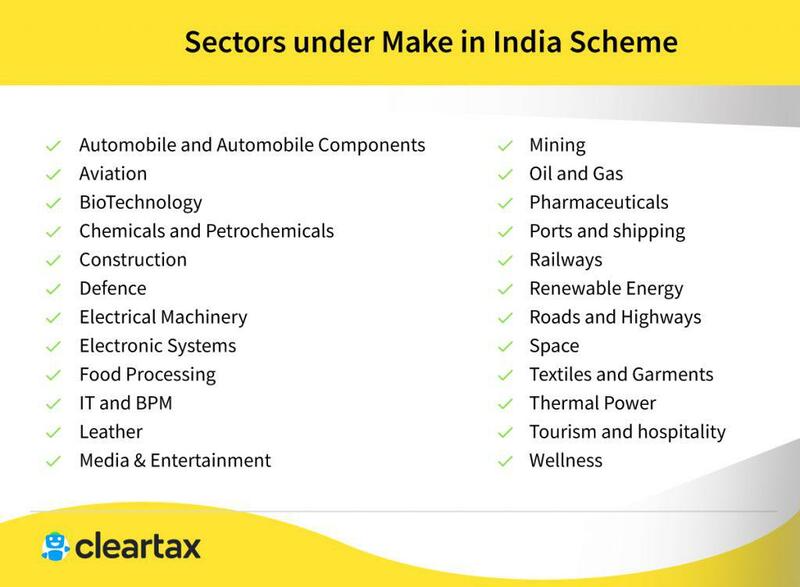 The Make in India campaign is the brainchild of Prime Minister Narendra Modi. It is a movement covering a bouquet of all the sizable sectors of our economy. GST has relaxed the procedural system involved in tax and also aided in reducing the production costs. In the recent past, digitization has taken the centre stage. The birth of the company and its survival has been made easier by a seamless online system. The new Insolvency and Bankruptcy Code has your back during your rainy days by a robust restructuring mechanism. Schemes like Jan Dhan Yojana and Prime Minister’s Jan Dhan Yojana aim at financial inclusion of all the citizens. The term Foreign Direct Investment has been doing the rounds for a while now. Liberalization of Foreign direct investment has been brought about an increase in the inflow of funds and has also helped in making India an open economy. The after effects are sure to be positive due to job creations. Connectivity is key to expand the businesses. The Sagarmala programme and Bharatmala Pariyojana Programme are trying to achieve the same. Technology did not have its presence in the rural areas. However, now, with BharatNet making digital delivery of various services across the country is initiated. India is Worlds No 4 in terms of its capacity to harness power from winds and Worlds No 6 in solar power. Further, ease of doing business is the cardinal aspect under the Make in India scheme which will motivate the companies to invest. 1. Faster Adoption and Manufacturing of Hybrid and Electric vehicles (FAME) and National Electric Mobility Mission Plan 2020 (NEMMP) has been launched to promote electric cars. 2. Common User Domestic Cargo Terminals have been operationalized in 13 cities so as to facilitate everything related to cargo services under one roof. Indian Talent + Information technology = India Tomorrow. Railways India stands tall with a ranking of World No 3 in terms of the railway network spanning more than 66030 Kms. 100% FDI provides an opportunity for high speed railways and electrification. 2. In order to encourage usage of renewable energy sources clean environment cess has been doubled form INR 200 per tonne to INR 400 per tonne. 3. April 2014 to October 2016 has witnessed an addition of 50471.41MW to the generation capacity. Over and over again the world is invited to come to India and have faith in the country because India promises a fair system and the best it can, without leaving any stone unturned. If size really mattered the elephant would have been the king of the jungle. Let’s Roar and make our presence felt!